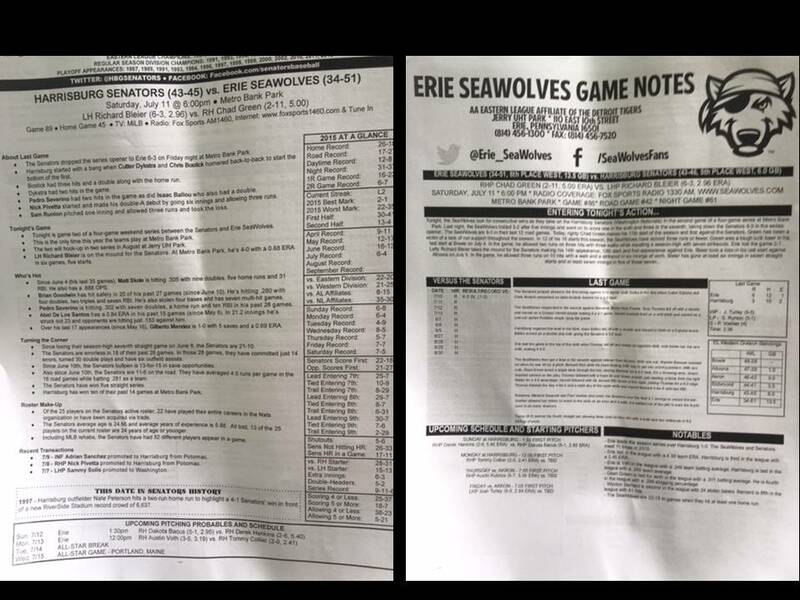 If I had to choose one word to describe my trip to Harrisburg to see the Class AA Senators take on the Erie SeaWolves, it would be AWESOME. Thanks to the incredible front office staff, particularly Perry Mattern, Asst. Director of Broadcasting & Media Relations, I was granted a press credential for the game and was able to experience the game like very few fans get to. Evey staff and media person I met was very friendly to this rookie blogger and helped me (and hopefully you) gain an inside look of what goes on behind the scenes during a game. And I have to say, even without securing a press credential, I’d have to say that Metro Bank Park, and the activities available on City Island, make this one of the best venues to visit! Shortly after purchasing club level seats for this game, I reached out to the Senators and asked if it was possible to visit the press box. Many fans, like myself, are interested in what goes on behind the scenes during today’s modern games. 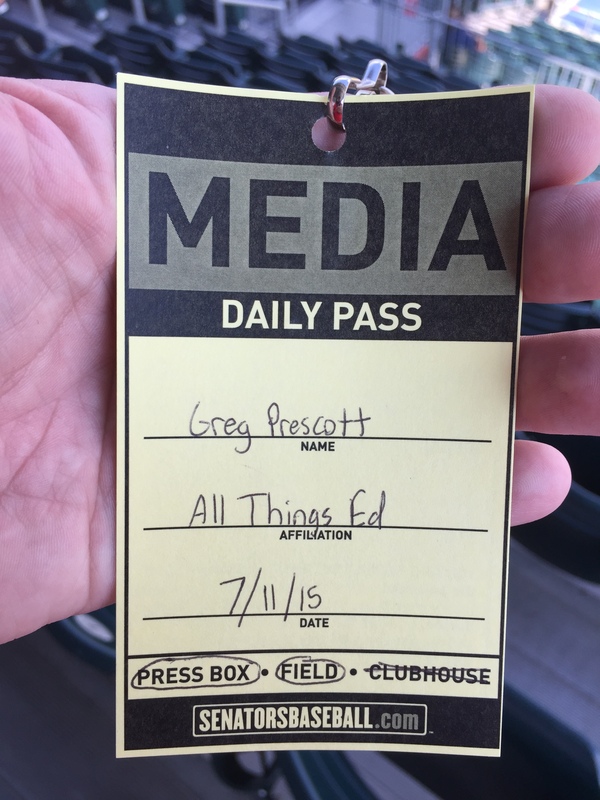 Was I ever surprised when not only did they agree, they issued me a true press credential for the game. Whereas I thought I was just going to be able to poke my head into the press box and maybe take a few pictures, this now allowed me full access to the press area and even the camera wells if I wanted. This changed the entire course of the way I was going to look at the game. I decided to spend the first few innings up in the box, then venture out and look at the game from a fan’s perspective. And being the new kid on the block, I didn’t want to be obtrusive and monopolize anyone’s time. They were there to do a job, and didn’t need me nosing around and distracting them! That said, I did get to meet some of the staff and chat it up with others working the media table. 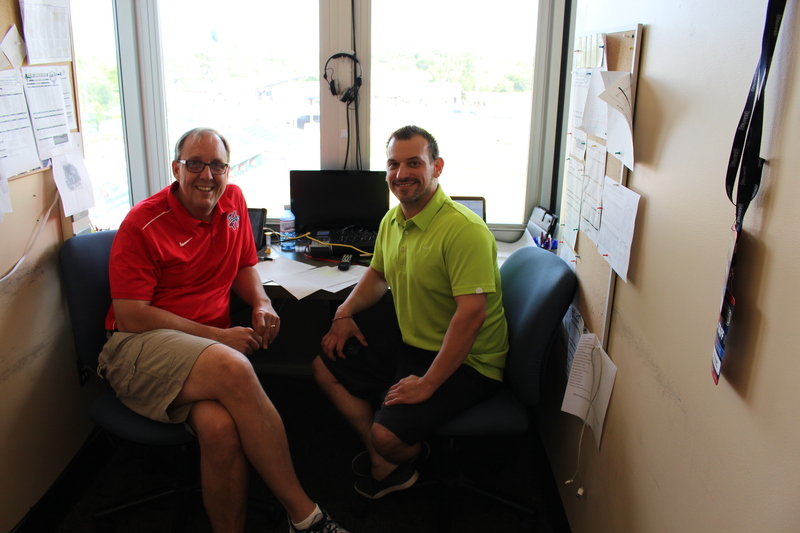 Prior to the game, I was lucky enough to meet up with Senators’ radio announcer and Director of Broadcasting & Media Relations Terry Bryrom, and his SeaWolves’ counterpart Greg Gania. They were reviewing game notes and media packages for today’s game. 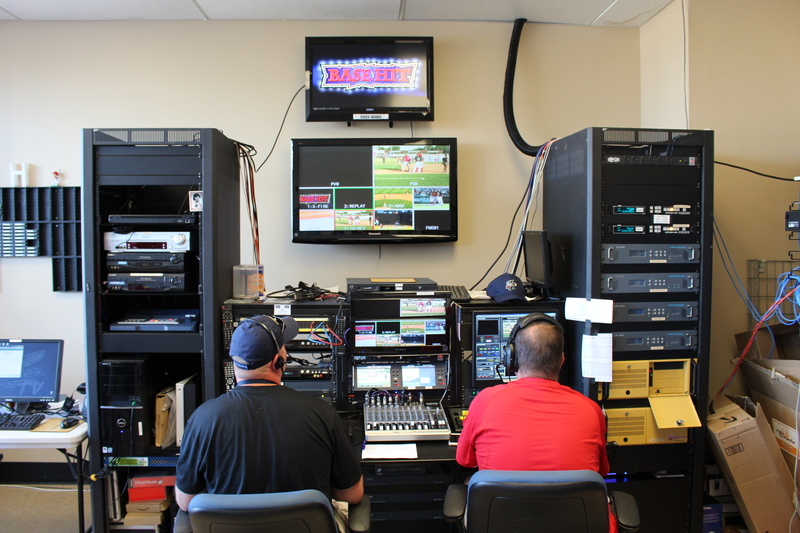 They broadcast over 140 games a year and travel extensively covering games in the twelve team Eastern League. Their schedule takes them as far south as Richmond, VA and as far north as Portand, ME. Traveling with the team, they both noted it requires a lot of clothing, mainly to keep from freezing on the team bus! The media and staff typically sit in the front of the bus, but to keep the back cool enough, the front is cold enough to hang meat! 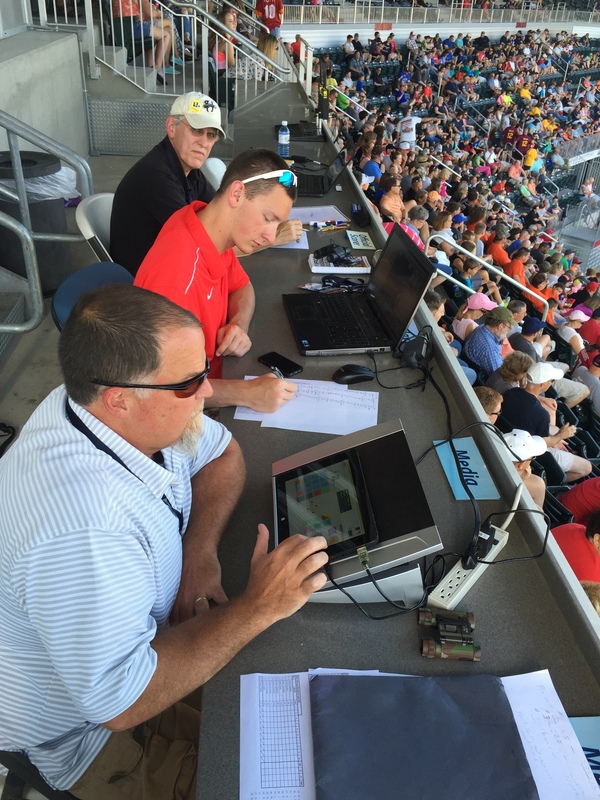 Ever wonder how announcers are able to relay so much information about the team and players? Prior to every game, each team updates their media guide to include notes from the previous game, who’s hot, recent transactions, and updated playe stats. The information is exhaustive, and something every fan would relish. Note to minor league teams: you could probably print off a couple hundred of these and sell them with the programs for an extra buck or two and they would move like hotcakes! Next stop was the media room. It takes a small army to go through the video feeds and to work the scoreboard, announcing, etc. The coordination of all the on field activities, the camera angles, and making sure everything is in sync is amazing. And yes, many MiLB games are streamed through MiLB’s app, MiLB First Pitch. The app has all the features of the MLB At Bat app, with the ability to purchase over 5,000 minor league games throughout the year. 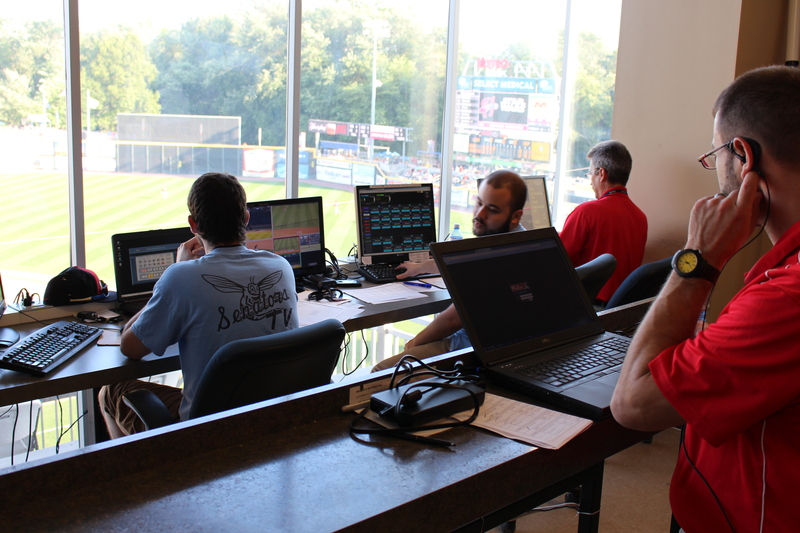 It turns the press box of even minor league games into a state of the art production facility. 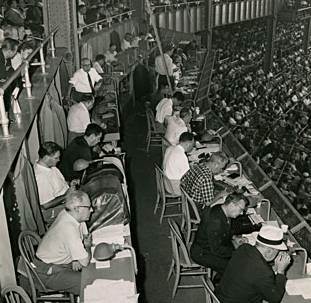 This is NOT your father’s press box! The job of PA announcer has really evolved over the years. 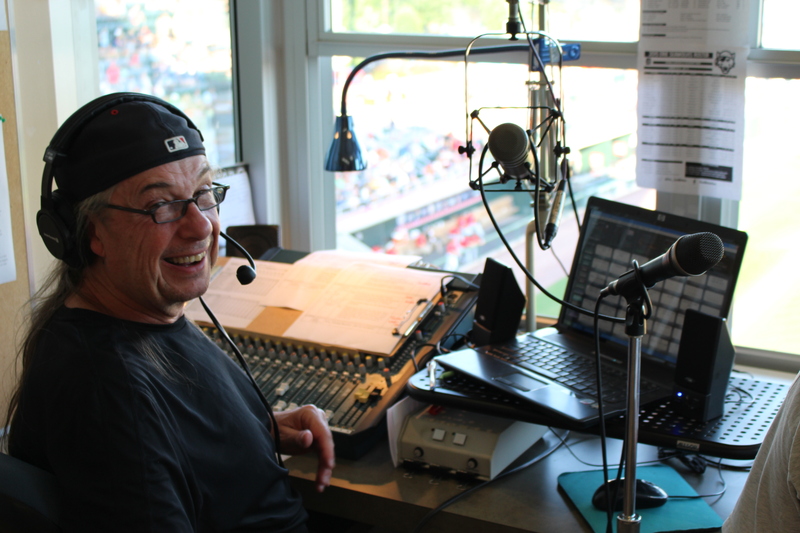 Not just announcing players and making in game announcements, the PA announcer is responsible for all the stadium sound effects, player walk up music and so much more. Again, it takes a tremendous amount of coordination between the whole team to make it work seamlessly. 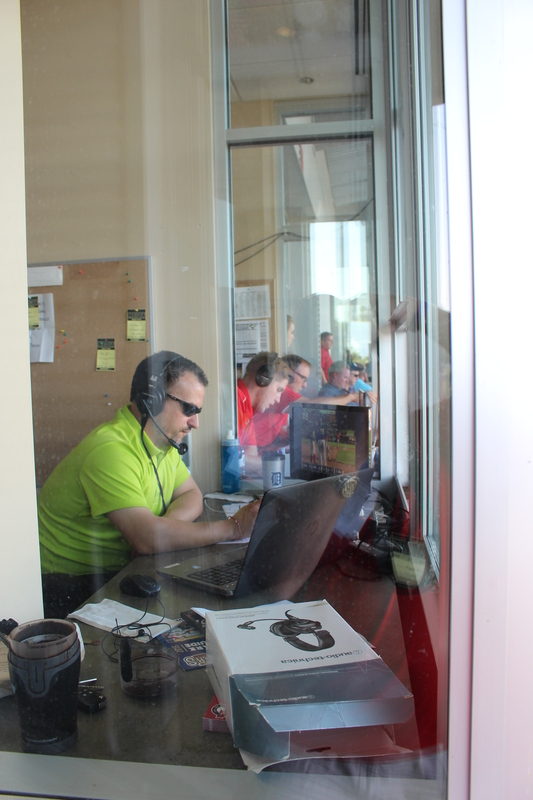 Here, Senators announcer Chris Andree is shown behind the mic and working the house sounds. Unlike some ball parks where the sounds try to trump what’s going on in the game, Chris perfectly blended the right sound effects at the right time without trying to take over the game. 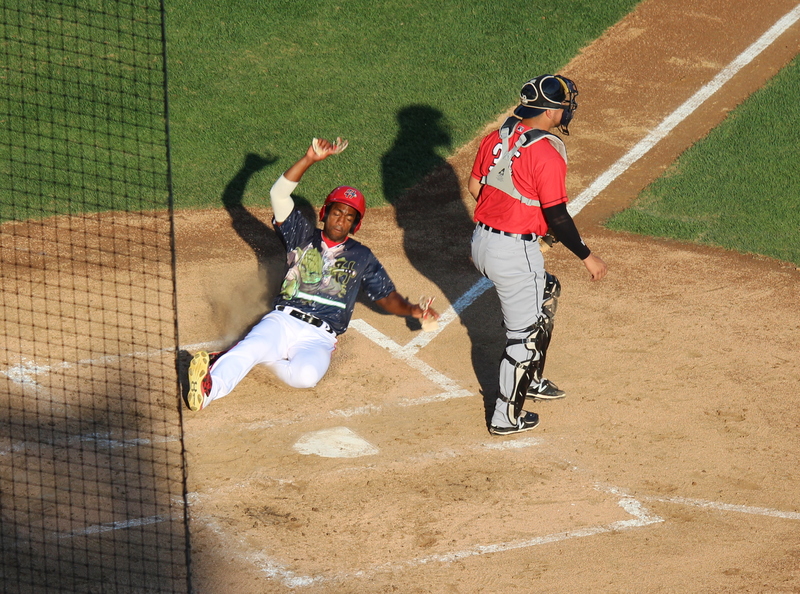 A perfect example was when Brian Goodwin of the Senators hit a two run dinger in the 6th inning, Chris played a very appropriate air raid siren! My comrades at the press table were equally as impressive and important. 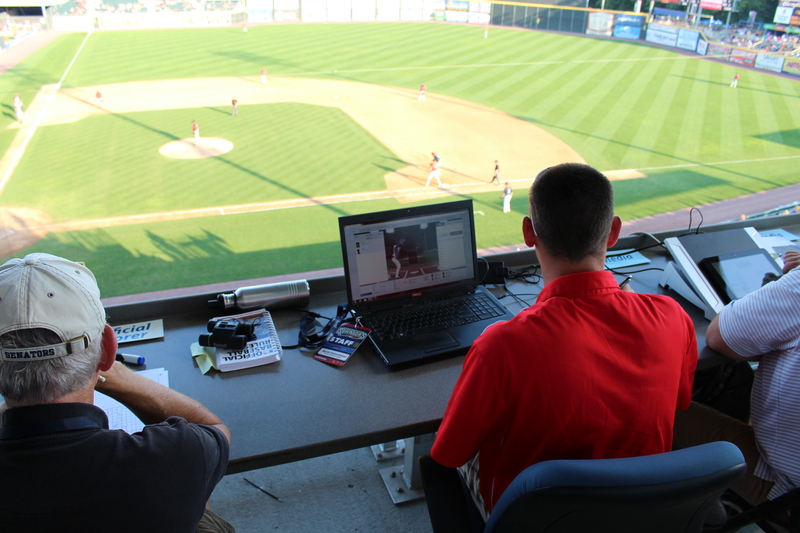 Here’s where the official scorer sits, along with the operator of all in game action on the First Pitch app and the operator of the clock for the new pace of game clock. Professional baseball, in order to speed up the game, has instituted new rules to monitor the time between innings, between pitches, and the change of pitchers. Tom (foreground) is operating the pace clock (and also works as an official scorer), Jake is working the First Pitch program, and in the background is the official scorer, Terry. It’s interesting to note that the official scorer DOES have the ability to review instant replay to determine the ruling on plays. However, it’s just the video only, he doesn’t listen to any of the commentary. This actually occurred during today’s game where a play was initially ruled a hit by Drew Vettelson but was later ruled an error. Thus, no RBI for Vettelson. I have to say the view from the press box was amazing! As a fan, my experience at Metro Bank Park was second to none, and it’s one of the most, if not the most, family friendly parks I have visited to date. Metro Bank Park sits on City Island, a mile long island in the middle of the Susquehanna River. This 63 acre recreation area has miniature golf, batting cages, horse drawn carriages, a working small guage (2 foot track) train, and also offers river boat cruises along the Susquehanna on the Pride of the Susquehanna. It’s accessible by either car or by walking along an old railway bridge converted into a walkway from downtown Harrisburg. The gem of City Island, though, is Metro Bank Park. The park was originally built in in 1987 (known then as Riverside Park) and sits on the same site where previous Harrisburg minor league teams played from 1907 to 1952. The original Senators began operations in 1924 in the New York-Penn League. A flooding of the Susquehanna in 1932 ended their minor league affiliation with the Boston Braves, and Harrisburg saw a few more teams come and go between 1932 and 1952. The current team (with various affiliations to MLB clubs) moved into the friendly confines of Riverside Park in the late 80s. Metro Bank Park has plenty of kid friendly games, as well as a plethora of good eats. While my club level seats (and press pass) afforded me the opportunity to eat in the club level restaurant, I also explored the various concessions available. I stumbled upon a monstrosity of a hot dog called the Hot Mess. This was a hot dog topped with spicy hamburger bbq, shredded cheddar, and topped with fried onion straws. Even though I had some delicious grub at the buffet, how could I resist tying this! Trust me, it’s as good as it looks! The park offers fantastic views from every angle. Star Wars night was a lot of fun, and not over done by the team. I’ve been to Star Wars and Jurassic Park nights before where the theme seems to take over the game, but this was not the case. Aside from some pregame activity, it was primarily limited to fan interaction during the game and the players wearing commemorative jerseys. Well done! Hey, even a storm trooper needs to eat! There was even an on field proposal during a between inning “game”. I think she said yes! Congrats to Michael and Kristen! The action on the field was no less spectacular! In the end, the hometown fans went home happy with a 5-3 win over Erie. 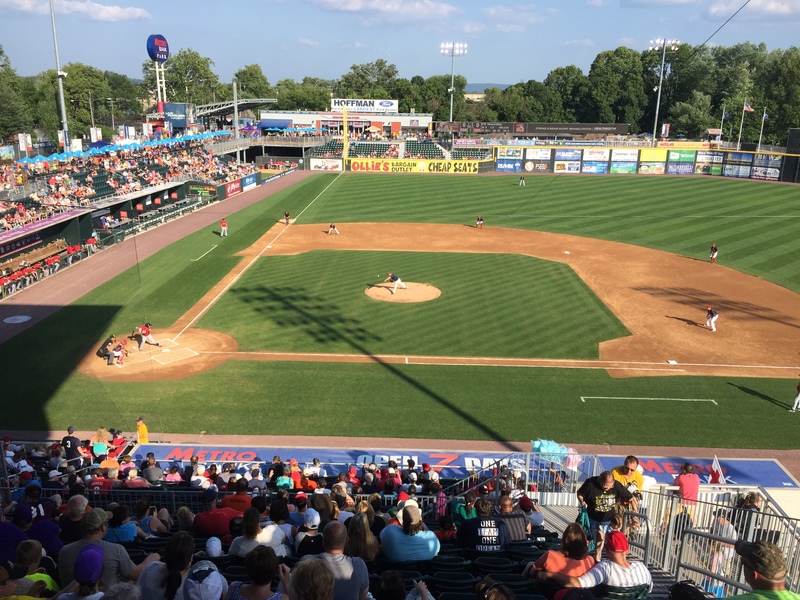 If you are looking for a fantastic family fan-friendly outing, look no further than Harrisburg and the Senators! Editor’s note: there are so many other photos and stories I would love to share. I took roughly 250 photos to put together this day’s blog, each one could tell its own story. This is my longest blog post to date, and thanks for reading this far! Next Post Bacon & Baseball (aka Hog Heaven)! Great article. Wish you were writing dailies for a sports page. Now we definitely have to put this on our list for a weekend trip! Great writing and excellent pictures – especially the action shots! Great article. Having been to several games at Metro Bank Park, the ambiance of this field and City Island bring true meaning to “For Love of the Game”. It feels like home. A must visit for sure. Wonderful memories for this gal who travels from Florida to watch a skilled coaching staff and the boys of summer! Thanks Lynn. I could have written much more, including about the all male dance review, the great views from the outfield boardwalk, the kids zone, the big flood of 2011….. But I was up to over 1500 words already. I am not going to a game this weekend so I might have a part two coming. Thanks for reading! Ha..the all male review..the first time I saw it I thought it was hysterical. 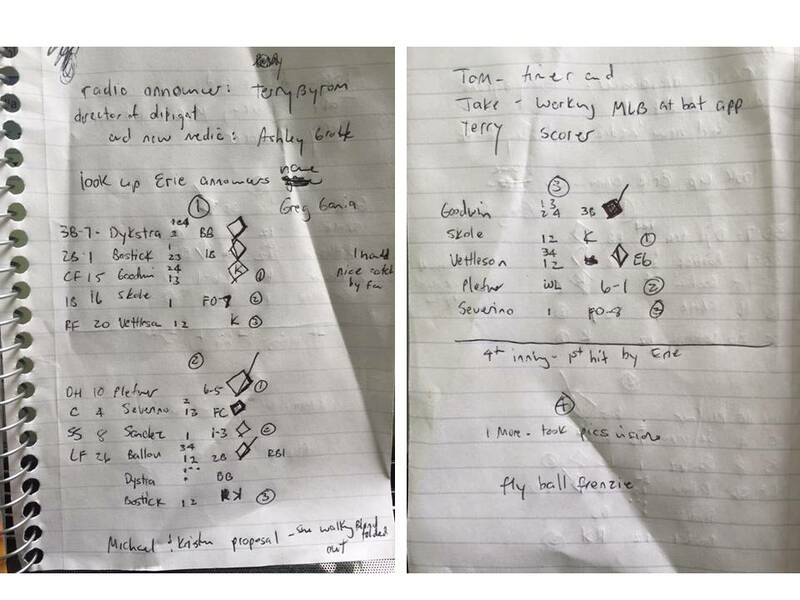 After attending or watching so many of the games on MILB.TV..well..gotta admire their consistency:) Would love to see more pictures! Look forward to part 2! Wow, what a great experience, and thank you for sharing. It certainly makes me want to take the trip to a Sens game. Star Wars nights are a lot of fun, too. We just went to one this past weekend in West Michigan. For everyone who left a comment, thanks so much! Coming this weekend, another ballpark, another press pass! After buying a seat, I asked for (and received) a press pass for the Lehigh Valley (PA) IronPigs game this Saturday. I’ll arrive early and take lots of photos with my Brownie, then do up a post for Sunday. Baseball and bacon, doesn’t get any better. Thanks for reading!